Taipei, Aug. 8 (CNA) President Tsai Ing-wen (蔡英文) said Tuesday Taiwan is committed to peace and stability in the Asia-Pacific region and must play a "more proactive" role there. 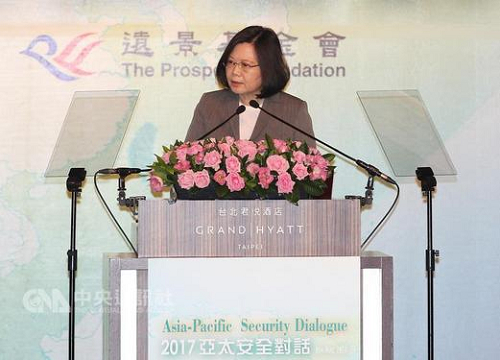 In an interconnected world, "Taiwan must play an even more proactive role in the region to help shape its growth," Tsai said in a speech at the opening of the Asia-Pacific Security Dialogue in Taipei. Part of the commitment, the president said, is in the area of security because maintaining regional order benefits all countries in the region. Tsai said one security threat in the Asia-Pacific region is North Korea, and Taiwan has helped implement economic sanctions against Pyongyang, and "has stepped up investigations into money laundering and shipments going to North Korea." She did not elaborate. She promised that Taiwan will continue to work with international partners on the North Korea issue. In addition to security, countries across Asia have also built strong trade and people-to-people relations, and Taiwan cannot be excluded from the process, which is why her administration launched the New Southbound Policy. As part of that attempt to be more proactive, she said, Taiwan has been helping train human capital from emerging countries, with 31,000 students from countries covered by the New Southbound Policy currently studying in Taiwan. Taiwan has also focused on building relations with the United States, Japan and other like-minded countries to promote exchanges in trade, security, global health, and green energy, she said. But while Tsai seeks a more active role in the region, concerns remain that Taiwan will be shut out from the process, as China’s influence grows and Beijing does everything it can to shut down Taiwan’s maneuvering room in the international community. Southeast Asian countries and China, for example, adopted a negotiating framework for a code of conduct in the disputed South China Sea at an ASEAN ministerial in Manila on Monday, a meeting to which Taiwan was not invited. Taiwan controls Taiping Island, the largest of the Spratly Islands, and claims the other islands in the South China Sea. Tsai described the South China Sea as another potential flash point in the region, but said Taiwan will continue to use its presence there for humanitarian and research purposes, instead of aggression. Taiwan will continue to safeguard freedom of navigation and overflight in the South China Sea, despite its exclusion from regional dialogue, the president pledged. On trade, joining the Trans-Pacific Partnership trade bloc is still one of Taiwan’s top priorities, even without the U.S., and Taiwan will also promote trade and investment through bilateral or multilateral arrangements, she said. On the issue of relations across the Taiwan Strait, the president reiterated Taiwan’s commitment to maintaining the cross-strait status quo. "However, this cannot be achieved by one side alone," she said, adding that it takes efforts from both sides of the strait. She expressed hope that the two sides can work on a new model for cross-strait interaction, which would benefit both sides and the region. Noting Taiwan’s geographic location, the president said Taiwan plays an important role in peace and stability in the Asia-Pacific region and is committed to that role based on its belief in democracy, freedom and rule of law. Growth and prosperity cannot take place in a unstable or insecure region, she said. The Asia-Pacific Security Dialogue, organized by the Prospect Foundation, brought together scholars and experts from home and abroad to discuss geostrategic shifts, maritime issues, and Taiwan’s New Southbound Policy. The foundation was commissioned by the Ministry of Foreign Affairs to organize the event.